Put the dragon back into your dungeon! Want to unleash a dragon on your players, but the PCs aren’t high-level enough yet? You don’t have to wait any longer. The Book of Drakes lets you bring the most iconic monster in fantasy into your Pathfinder Roleplaying Game today. Whether you’re adventuring in Open Design’s world of Midgard or your own home setting, drakes provide unique adversaries, unusual companions, and compelling NPCs. 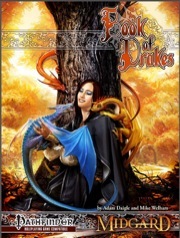 Get The Book of Drakes today and bring on the dragons! I love dragons and I love playing in settings where dragons have an important and prominent role to play. However, this is not a book of dragons, but a book of drakes! Let me start by saying that this book is among the most beautiful that I've seen to date, and I am talking about the print version, which is black and white! I believe the pdf is in colour. Everything in this book has the feel of an old book of drakes and that is also how most of it is written, as a treatise on drakes. First we get a little overview of drakes (how they are classified and how they are different from dragons), then we get the meat of the book, the player's section. This chapter presents you with new feats, alternate class abilities, an alternate class (the drake tamer), a prestige class (the master of drake forms), rules on how to play either a pseudodragon or a candle drake, spells, magic items and some more general adventuring gear. There is a lot to like here, especially the rules to play a pseudodragon or candle drake. Next up is the bestiary! This book presents a lot of drakes, 20 drakes to be precise, with some amazing artwork. Personally, I am not a big fan of the whole drake philosophy (as this book presents it), that drakes are all over the place and come in an infinite number of shapes, however, those few that the book presents are really useful and will certainly bring the wondrous drakes into the game. And not to worry, while the drakes seem cute and harmless (especially if you look at the cover), there are evil drakes lurking among the shadows, like the sewer and mist drakes. This chapter ends by presenting rules on how to build your own drakes (basically a point-buy system). I haven't tried this system out, so I don't know if they work. I really liked this book, although I would hardly use drakes as the book suggests. The book of drakes sets out to bring drakes into the world and they succeeds beautifully in doing this! Good work! Outstanding book on little dragons. It talks about the first drakes, differences between them and dragons, sample treasures, their role in the Midgard Campaign setting, a list of 40 unclassified drakes and it ends with 10 drakes of note. It starts off with how to use drakes as companions, next it lists 10 feats for drakes or having them as companions. Next is alternate class abilities, some like with the alchemist(summoner and wizard) gives the PC a drake companion, others like the barbarian(fighter, monk, druid, oracle) lets them learn a special ability from drakes, while others like the bard(inquisitor, rogue, ranger, and witch) just get new class options, or the clerics new drake domain, or the new sorcerer drake bloodline, Paladin Archetype, cavalier order. There is also a new alternate class based on the summoner with a focus on a drake instead. A PrC Master of Drake Forms which focuses on shape changing. Next we get two drake races as new PC races, the pseudo dragon and candle drake. Next we get 16 new spells. Followed by 7 new magic items, 4 drake weapons and 3 drake equipment items. This section starts off with stats and information about 20 new drakes, with full stat blocks and art. The range from CR1 to 14 and are fairly evenly displaced across the CR range. The next section is advice on how to build your own drakes. The section on building your own drake is very in depth and you should have no problem at all being able to quickly and easily build any drake you could imagine. Closing thoughts. The art work is color and ranges from good to pretty good. Editing and layout is top notch, I didn't notice any errors at all. While the book is mostly focused on drakes there is some useful information on class options, spells and magic items as well. There is just not a lot I can say about this product, or really there is to much and if I start listing all I liked about it this will turn into a 10 page review. So instead I will list everything I didn't like about it. Which was nothing, so I will skip to a couple of things I wish they had added but didn't. I think it would have been nice to have a witch drake patron and option to replace their familiar. Also I think it would have been neat to have seen a monk fighting style based on drakes, thought the styles for PFRPG came out after this book so that's understandable. Basicly other than a few nitpicks like the couple I just listed I have nothing at all negative to say about the book. If drakes interest you in the slights this book is well worth the price and you won't be disappointed picking this up. So what's my rating? Well with how well done it is, I have no choice but to give it a 5 star review. The Book of Drakes had me nodding my head in agreement in the Welcome page. I rarely use dragons in a game because they're so powerful and alien, and I cringe whenever a dragon fanboy player wants to have a draconic bloodline or, worse, become a Dragon Disciple. But games like Pathfinder lose something deeply fantastic if draconic elements are entirely excluded. The drakes in this book have a charming, whimsical, yet dangerous quality that is more accessible and somehow more human than a full-blown dragon. Midgard specifics take up very little of the space in this book, and help non-Midgard GM's see how drakes can be used in other settings. Other reviews go into detail about the structure and organization of the book, so I'll simply add my impressions to what others have said. Overall, the elements presented in this book are flavorful and well-balanced and designed. I have not seen anything yet that I would not allow a player to use at my table. However, I would be careful of using drake companions too heavily. These are not simple animal companions which can be run by the PC. Each is a full-fledged character. Drake companions will need thought and care on the part of the GM to give them their due. I would run them as GMPC's, which can be a lot of work. Different drakes are lovingly and clearly detailed and usable right off the page. There is a nice variety for different situations and alignments. This is one of the books I'd keep handy as a GM in case I needed an interesting ad hoc NPC. And if detailed ecology and player information and a whole cornucopia of fun drakes isn't enough, the section about building drakes lets a GM expand the book to suit their own campaign. The rules are easy and clear and the examples useful. 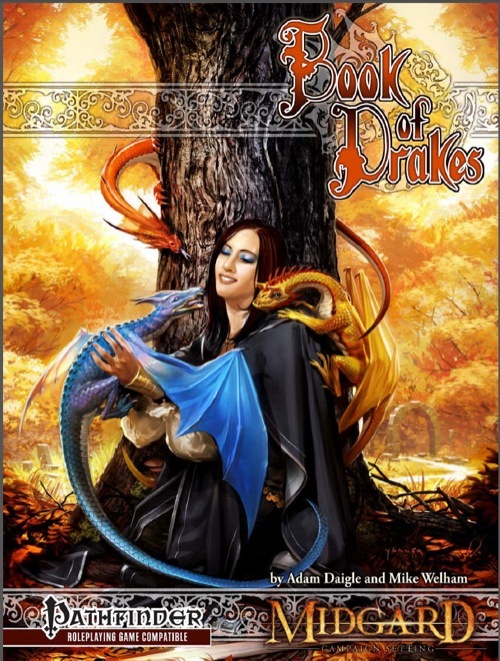 The Book of Drakes is a wonderful addition to any gaming library. It's beautifully designed and written, full of substance as well as fun fluff, and the illustrations are absolutely gorgeous, perfectly reflecting the character of the drakes they illustrate. I give it five stars. Maybe now Wolfgang Baur will return the authors' pets? The Book of Drakes belongs on your bookshelf. I confess to being enamored of pseudodragons for a long time, and this book is exactly the kind of book that almost seems designed to appeal to me. Daigle and Welham have hit a home run. The descriptive text is evocative and the rules are well-considered. All of the drakes would make interesting NPCs and/or player companions- and I do love that there are options for playing a drake PC yourself, if you're inclined. There's lots of good information for players and GMs both. One of my favorite parts of the book is the section covering rules for designing your own drakes- I'm already planning to create my own drake familiar in a game I've just begun playing in, and I'll be using the book to develop the drake as the character progresses. The art is definitely worth mentioning. The print version of the book is in black and white, and the color version of the book is in color. Both work, but the color is definitely something that everyone should see. I'm very much hoping that the people at Open Design will be able to some day release the special edition that Hugo Solis brought to Paizocon, which from pictures (and raves from those who saw it) seems pretty incredible in its own right. The Book of Drakes is big! Sixty-two pages packed into an eighteen megabyte pdf file. It is also lavishly illustrated (this is the first game supplement which has ever prompted me to use that phrase) with a multitude of high quality full-color pictures. Cover artist Kieran Yanner and interior artist Hugo Solis have done truly magnificent work. OK, so it’s big and beautiful, but is it useful? Happily, it is! Before I tell you why I think this book about little dragons is useful, let me take a moment to talk about big dragons: Dragons have been centerpieces of legend since the dawn of history. People have been telling stories and even composing operas about them for centuries. Whether in a story or in a game, they make great Boss Monsters for heroes to strive against. However, being so big and powerful, they have to be applied sparingly. When used as opponents they can quickly wear out a group of PC’s; as allies they can overshadow the players and take away all the excitement. Wanting to inject more dragony goodness into the game, lots of efforts have been made to create lesser draconic races. Sadly, attempts to scale back the power of dragons while still keeping them interesting have met with limited success. Mostly what we’ve gotten has been a confusing medley of half-dragons, which were not only less powerful than true dragons, but also less interesting. Chapter 1, “Ecology of the Drake”, is an in-depth introduction to drakes. We get a lot of good information on what drakes are like, how they fit with their surroundings, and how they are likely to interact with characters. It also lays out a classification system which is quite broad, yet flexible enough to fit into any campaign. Drakes, it turns out, are far more varied than dragons. Some drakes are very much creatures of this world, living in gritty urban environments, while others are almost like patron spirits of various philosophies. This chapter is also jam-packed with inspirational examples, several of which I plan to lift whole-cloth into my game world. Players and GM’s alike will find plenty to interest them in this chapter. True to the note on the cover, there is also a section in this chapter describing how drakes fit into the Midgard campaign setting. If you are not familiar with Midgard, don’t let that put you off. This is a well-designed supplement, meaning pretty much everything is portable to other settings. To use this information in your own world, the worst you’ll have to do is change a few place-names. Chapter 2, “Players and Drakes”, provides just what it promises: Ways for players to have their characters interact with and benefit from drakes (usually, but not always, on friendly terms), and even guidelines for using drakes as characters. There is a list of alternate class abilities which shows some love for every one of the base classes - or, in the case of the Inquisitor, shows a new way to display some inquisitorial disdain. There are new feats, new spells, new magic items, new class abilities, and even two new classes: Drake Tamer (base class) and Master of Drake Forms (prestige class). Chapter 3, “Game Masters and Drakes”, starts out with a bestiary presenting stats for twenty different kinds of drake, spanning the Challenge Ratings from 1 through 14. Every one of these creatures is novel and unique. A staggering amount of imagination has gone into the attributes and features presented here! Also in Chapter 3 is a section titled “Building Drakes”, which details how to create completely new kinds of drake for your campaign. Unlike other “how to build a monster” articles I’ve seen in the past, many of which were not really all that useful, this section has good, solid, practical guidelines and suggestions. In addition to the twenty sets of monster stats in Chapter 3, in Chapter 1 we are given suggestions for twenty more types of drake plus descriptions for ten additional special NPC drakes. Fifty kinds of drake are lurking in this book! Count them – fifty! You can find everything from the inoffensive little Candle Drake all the way to drakes that are genuine forces of nature. My favorite (so far) is Wheshadulen, a unique NPC drake who claims an entire river as his lair. He has spent centuries sculpting his river’s course through the countryside, bestowing benevolence or visiting malevolence along its shores as he sees fit. The next time you need to cross a river remember to throw in a nice fat goat first. It may be Wheshadulen’s river, and he may grant you a safe crossing in return for your tasty gift. Don’t wait – fill your games with dragony goodness now! OMG! It's out in the wild (kinda). This has been sitting hidden in preorder on the KQ site for a week or so, but until there was any big announcement, I didn't want to jump the gun. Also, Adam's rules for creating your own drakes will keep your game in drakes for several hundred campaigns. Woot... and now part and parcel of the Midgard setting too. A swarm of drakes. Great. Badger apocalypse has now begun. Spoiler: There are no swarms in this book. Also, hidden under the rock is a swarm of dung beetles. Okay, now I'm thinking about a swarm. Thanks. Y'know, using the drake building rules, you could build a tiny one and then make it a swarm. A swarm of tiny drakes, that reminds me of a book I read by Anne McCaffery (not sure on the spelling). make them blue drakes and mouse like.............. Swarm of Pikachus!! I'm sure Taig totally wants to do a free web edition swarm template. Lots more drakes inside the book! Thanks for posting some teasers, Hugo. And to think this is but a small fraction of all the awesome illustrations. I want an alehouse drake bookstand. And a plushy too. Will this be available as a PDF? Shipping overseas is a real killer. I might be interested in getting this, but mostly for the Midgard campaign info that might lie within its covers. What percentage of the book details the Midgard campaign setting? Twin Dragons, it's a sourcebook for drakes and magic anywhere, but we worked hard to get some specific Midgard examples as well. Much of this is geography (where are particular species found), and some of it is cultural (just how crazy is the Dragon Empire about drakes? What's the relationship between pact drakes and the gnomes of Niemheim?). So.... The primary goal is new drake stats, spells, and lore. The setting material is there, but secondary to that. Great and Mighty Kobold-in-Chief, will this awesome book of awesomeness be available for purchase by we lesser mortals at PaizoCon? Having seen this at Paizocon I can say that this book is pure pleasure! Its beautiful, fun, and just plain cool! Pretty much every drake idea is "I want! I want!" and the thing is just a beautiful book. Bottom line is if you don't get a copy you are missing out on a small but delicious slice of pure awesome. Neoncon while it is nice to see a review. It would have been better if it had been a little more indepth and tell us a bit more about the product. What all is in it, what you thought was done well and why etc. Thanks for the very kind review, NeonCon! While it's not the real print version, Hugo made this extra-special-only-two-exist version for PaizoCon and I had to share it in this thread too. Taking a look at this at PaizoCon makes me very eager to get my hands on it. It's sitting in my cart awaiting my next paycheck for preorder. You guys get payed? When did that start happening? Will this one get a reprint? Or are there still additional copies flying around? From what I understand, we are still waiting on the printer. The copies that were available at PaizoCon were a special print run so we'd have the book at the convention. So....if I'm right, plenty of print versions of this are on the way. They are on a truck on their way to the kobold lair. Preorders should ship Friday or Monday. Will the print version be available for those of us who didn't pre-order? Please? Thank you for your review, Granfather. I'm glad you liked the variety of drakes and the rules for creating drakes. Curious when this will be available on drivethru (POD). I drooled all over those covers while at PaizoCon. No doubt Mr. Neoncon was too busy wiping off his cover to get an in depth review written. Essays are boring, demand odes. Regarding the product in question, I have the pdf and I skimmed it already. I will give it a thorough read through and review as soon as I get other tasks completed. If I had a mage PC, I'd want one for a familiar. I don't know if that is even possible yet, but I'd hound the GM (if it were not already me) until I could. I probably shouldn't reveal the dark secret that Adam and I wanted (some) cute drakes in the book. Hugo Solis really delivered on that count! The force of art is strong in that one (Hugo). Congratulations for being in the store blog too! I am now going to cry that I didn't try to pry some cash out of my own miserly hands to pick this gorgeous book up while I could (but shouldn't have) at PaizonCon. That was an extra-special-leather-bound-laser-etched-coffee-table-sized-only-two-exist version of the book Hugo made (yes..made, printed and assembled) just for PaizoCon. The cover of the true print is artwork courtesy of Kieran Yanner. All interior art is courtesy of Hugo Solis, and Carrie Winters did a gorgeous job with layout. Just skimmed the PDF. Not only the layout is great, the illustrations are without a fault excellent. I think I fell in love with the alternate summoner class, and as a GM, I thank you sincerely for the excellent chapter about building your very own custom drake. Can't wait to print it and read it properly.